FOR DECADES, the right has undermined Black protest and resistance movements as “violent,” “dangerous,” and “un-American” and has responded with militarized force. Under this administration, Trump and his allies are replicating and amplifying this strategy, using misogyny and antisemitism to further erode the basic foundations of political participation. Follow the money. I think Soros is the anti-Christ! He must go! Freeze his assets & I bet the protests stop. Trump and his allies’ deployment of misogyny and antisemitism in this moment are attempts to undermine our movements, echoing ways the right wing has long attacked protest movements on the left. The power of protest lies in its credibility as the voice of public opinion. 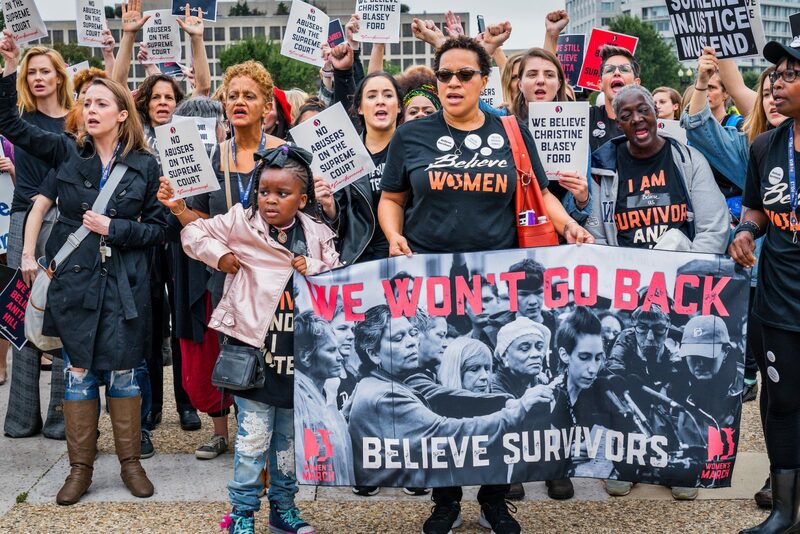 If women and trans protestors can be dismissed as pawns or operatives rather than agents of social change, then the power of protest is weakened. If a single Jew can be blamed for orchestrating the whole affair, then the power of protest is further eroded. This antisemitic rhetoric from the state echoes among white nationalists. In the days following Trump’s tweet and Brett Kavanaugh’s confirmation to the Supreme Court, fliers (created by the Daily Stormer) appeared on college campuses and in cities in California and New York. The fliers blamed Jews for orchestrating the assault allegations brought against Judge Kavanaugh. They read: “Every time some anti-white, anti-American, anti-freedom event takes place, you look at it, and it’s Jews behind it.” The Northern Virginia Jewish Community Center (the community center I grew up in) was vandalized with dozens of swastikas. Antisemitism and the idea of “outside agitators” is the right’s most effective tool for delegitimizing both the message and messengers of social justice. If protest can be blamed on those outside of the state, then both the message and the messenger are untrustworthy. Delegitimizing both is necessary to eventually repress or expel said “troublemakers” by the forces of “law and order.” And in fact, we saw the president say exactly that to a conference of police the same week as his post-Kavanaugh-protest Soros tweet. We know that we need a strong, vibrant, awake electorate holding elected officials accountable. Undermining the credibility of protest is an extremely effective tool of protecting those in power. Right-wing regimes have long broken down the fabric of political protest by using the antisemitic notion of rich Jewish financiers as the “puppet masters” of social unrest. During the Russian Revolution, the Tsar’s secret police disseminated the Protocols of the Elders of Zion, a fictional account of a meeting of rich Jews plotting to break down the society of their “host countries” and rule the world through the promotion of social upheaval. For a period, the Protocols did its job to undermine and destabilize the revolution against the Tsar. Because of its success, it’s been translated and promoted by right-wing ideologues around the world ever since. During McCarthyism, these well known stereotypes about Jews were used to tar communists and leftist movement activists (Jewish and non-Jewish) as untrustworthy, two-faced “troublemakers” with foreign loyalties detrimental to the United States. The over-representation of Jews and non-Jewish people of color (always seen as suspect by the white owning class) in leftist movement circles made these claims plausible. Through institutional state repression and violence—blacklisting, closures of organizations, and ultimately the public execution of the Rosenbergs—the Red Scare successfully decimated the social fabric of leftist movements. It is deeply troubling to see these same tropes, indeed some of the very same language, being used against today’s social movements by the president and leaders of the Republican party. Trump and other Republicans have regularly claimed that George Soros (the central target of this anti-Semitic messaging) is entirely behind the Movement for Black Lives. Here racism and antisemitism intersect: rather than admit that a strong, powerful Black liberation movement is growing throughout the US, some white people would believe that it is one or a few rich Jews propping up Black people to cause unrest in the streets and undermine white Christian society. It’s not just antisemitism on its own, but antisemitism deployed against the left that gives the lie about Soros its cultural power. Our side can point out that right-wing efforts are funded by the Koch, Walton and Mercer families all day long, but that fact and its broadcast never delegitimizes their endeavors. That’s because the Soros lie—the invocation of the idea of the scary, untrustworthy Jew—is built on top of a bunch of other assumptions: that “real” Americans are Christian and white, and hew to patriarchal gender norms and racial segregation. Luckily, we know how to fight back. We can recognize the ways in which racism, antisemitism, and misogyny are deployed to keep our movements weak and divided and we can refuse to fall for conspiracy theories. We can join together in the raw, tough, honest work of building multi-racial, multi-gender, multi-class, multi-faith movements. We can center the leadership of those most impacted. We can collectively disinvest from whiteness and practice multi-racial democracy in everything we do. In the face of the destructive attacks of the extreme right wing, we have an opportunity to respond with a solidarity that buttresses and expands democracy—a rebuttal to an oppressive past and a promise for a liberated future. Dove Kent is an organizer, educator, and movement builder based in Durham, North Carolina. She is the former Executive Director of Jews for Racial & Economic Justice.